This fine antique Edwardian English sterling silver vesta case has a plain circular form. 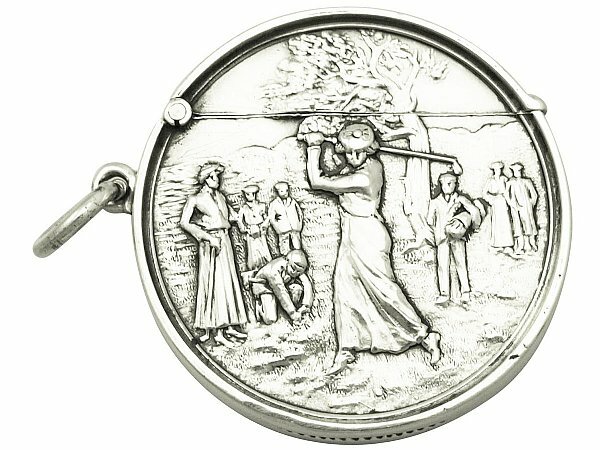 The front of this antique piece is embellished with a chased scene depicting a lady golfer in period costume with the supporting caddy, another player and spectators in the background. The reverse of the case is plain and unembellished. This piece is fitted with a hinged sprung cover and ring loop attachment to the side. This antique sterling silver vesta case is a very good gauge of silver, fine quality and in excellent presentation condition. Full hallmarks struck to the surface of this piece are all very clear; the first letter of the marker’s mark shows slight wear but still legible.